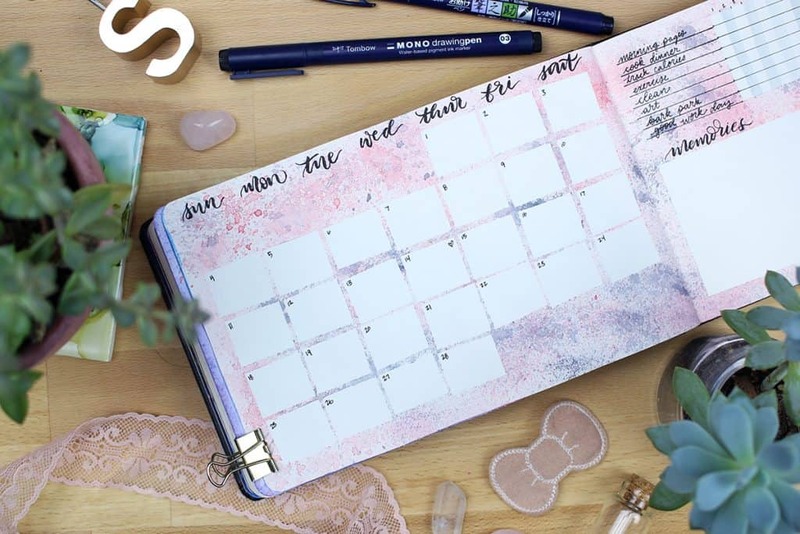 Welcome to yet another wonderful month where I managed to set up my February 2018 monthly set up way too late – just like January. It’s becoming a bit of a thing for me. But the point is, I got the monthly set up done and it looks pretty darn lovely if I do say so myself. Besides, I have a pretty good reason for being late this time! 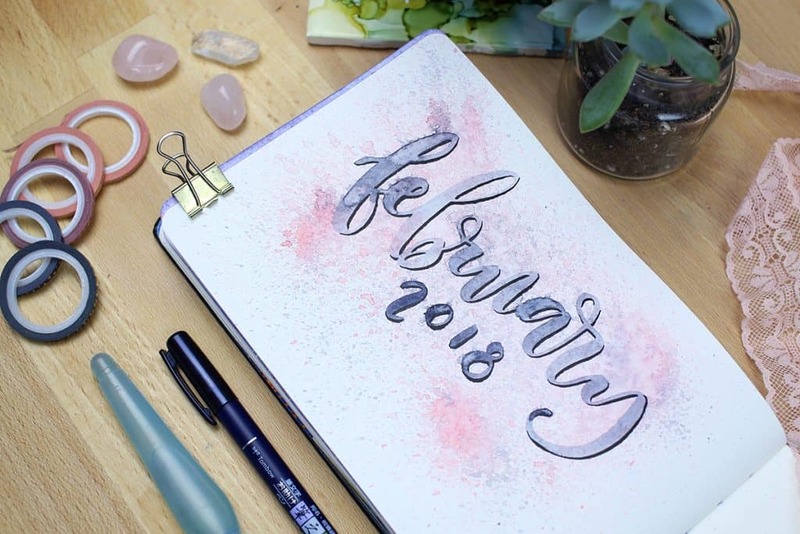 The reason I’m so delayed in getting my February 2018 monthly set up published is that of the launch of my new course Brush Lettering 101. 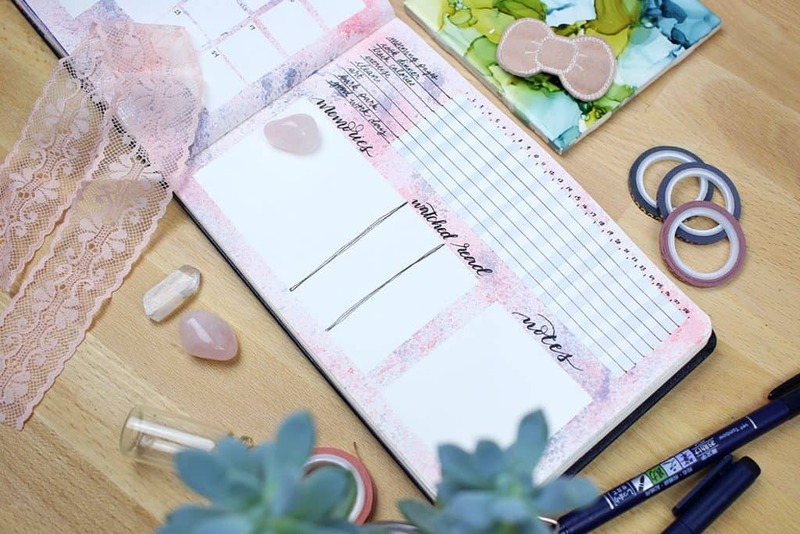 Back when I did my 2018 master plan in my 2018 bullet journal set up, I made January’s primary goal to complete and launch my new course. I have been working on Brush Lettering 101 for a few months now, and I wanted to try and get it totally done in January. I’m happy to report that I did, in fact, complete all the coursework – with over 45 minutes of video and 12 worksheets – before February rolled around. Unfortunately, I didn’t quite get it launched in January. However, I pushed back the launch for another excellent reason. At the last second, I decided to host a giveaway to celebrate the launch of the course – the Brush Lettering 101 Starter Kit Giveaway! Tombow generously provided a few packs of their amazing brush pens for me to give to one lucky person. That winner, plus three other winners, will also get access to Brush Lettering 101 for free. The giveaway ends on February 15th, so make sure you go check that out! You can find more details and enter the giveaway here. So while I didn’t quite hit my goal of completing and launching Brush Lettering 101 by February, I am extremely happy about how it all went down. This has been an amazing experience thus far, and there are already so many excited and curious students who have signed up for the course. Plus I can’t wait to see who wins the giveaway! Besides launching Brush Lettering 101 and hosting a giveaway, there are a few other things going on that I want to share. First and foremost – I cut my hair! I don’t mean a slightly different haircut. I cut my hair off. I’m rocking a pixie now! I put a picture on my Instagram stories a few days ago, and though it’s gone, I’ll surely be posting more pics in the future. Make sure to follow me there for regular silly posts and updates! The month of January also saw me getting accepted to be a Tombow brand ambassador, which has been a goal of mine for quite a while now. I’m honored to be brought on to represent Tombow and I can’t wait to make some beautiful work with them. I also have been obsessing over alcohol ink painting for the last month or so. This new style of abstract painting has absolutely won me over. Again, I don’t have any great photos to share with you (*cough* Instagram stories *cough*), but I have received a lot of interest and questions about my new obsession. For the curious, I use Ranger Alcohol Inks and Ranger Alcohol Solution on Yupo paper, though I occasionally use it on tile, too. From my understanding, you can use alcohol inks on any smooth, non-porous surface such as glass, tile, and Yupo paper. It’s been a ton of fun to play with this new medium, and I’ll hopefully have a tutorial or video up soon with more info about the process. You may have noticed that I made more than a few little mistakes in my layout. I was in a bit of a hurry, and it shows. The biggest one, of course, is that I accidentally left myself no room for a February title page! 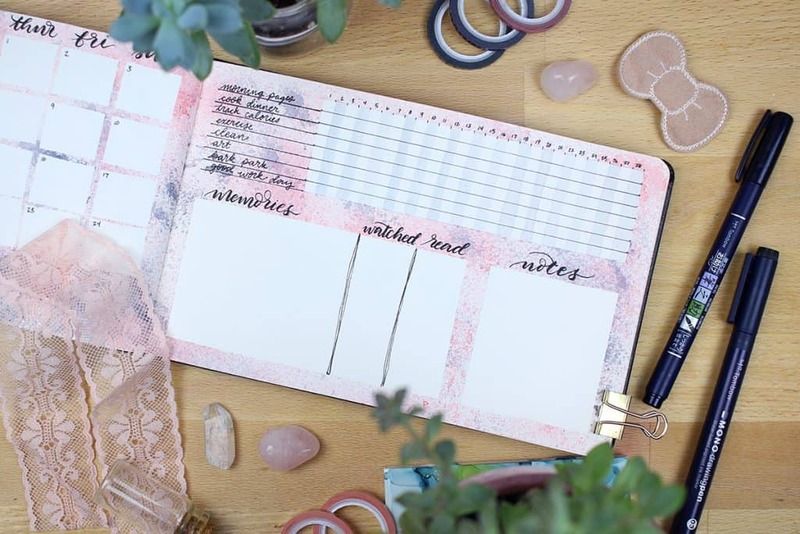 By the time I masked off all the boxes for my calendar and trackers, I realized my mistake. Instead of moving all that masking tape, I decided to say “screw it” and just plop my title page on the next page over. No harm, no foul! I also wrote “Sun” twice on my calendar, but I managed to pull a fast one and change one to a sorta misspelled “Sat”. 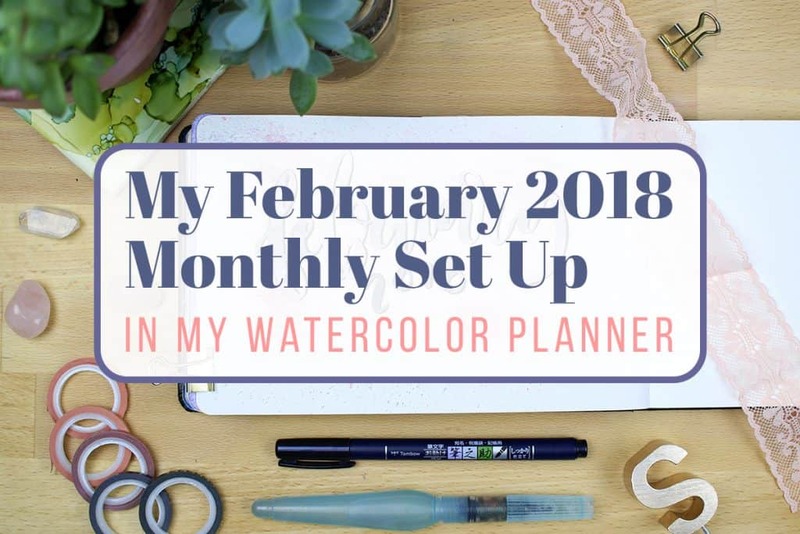 Now, let’s talk about some of the changes I made in my February 2018 monthly set up. They really are quite minor, but I make so few changes to this layout that I thought it was worth it to point them out! Both changes are solely to do with my habit tracker. In the month of January, I started tracking my calories in an attempt to lose a bit of weight. 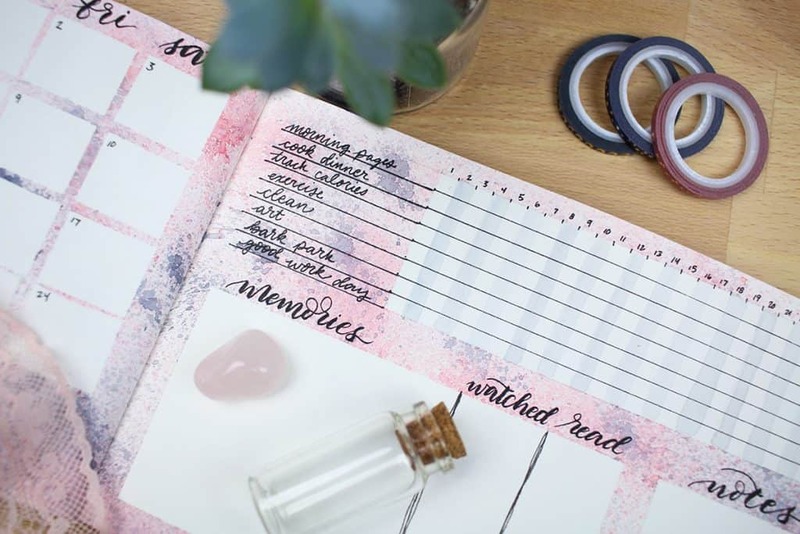 I talked a bit about my recent weight gain in my bullet journal weight loss tracker post. Anyway, I replaced one of my old habits, “drink soda”, with my new habit of tracking my calories. I figure I should only fight one big health battle at one time. I also added something of a grid to my habit tracker so it is easier to fill it in without guesswork or a ruler. One of the major disadvantages of using a watercolor planner is that the paper is totally blank with no grids whatsoever. After floundering around without a grid in place for several months, I decided to add lines for the rows and light watercolor columns to help act as a guide. So far, I love it. It’s so much easier this way! 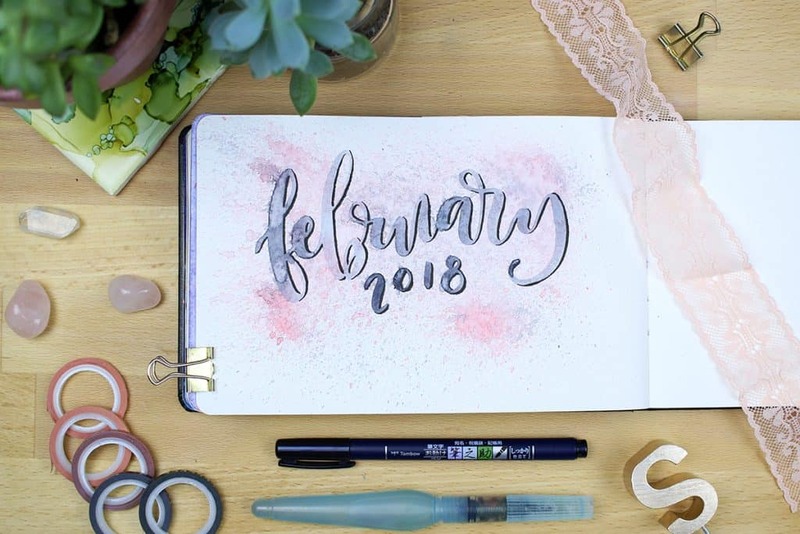 February has already been a wonderful month, what with the successful kickoff of Brush Lettering 101 and the exciting Brush Lettering 101 Starter Kit Giveaway. I hope to continue to make more creative strides with alcohol inks, watercolors, and more this month. And I sincerely hope to get my act together and prepare my March set up before we’re halfway through March! All in all, I’m excited about where I am in life and I’m even more excited about where I’m going. How was your January? Tell me below! You are an artist! It looks so amazing & I’m in awe.